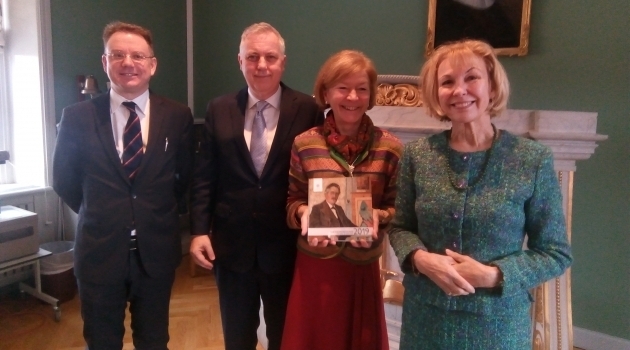 Professor Marie-Claire Foblets, Leuven and Halle, and Professor Andrew P. Simester, Singapore, recently appointed Honorary Doctors at the Faculty of Law, gave appreciated lectures on 24 January in connection with the conferment ceremony in Uppsala which was held the day after. Marie-Claire Foblets (born in 1959) is Director of the Department of Law and Anthropology at the Max Planck Institute for Social Anthropology in Halle, Germany, and Professor of Jurisprudence and Anthropology at the Catholic University of Leuven, Belgium, and Martin Luther University of Halle-Wittenberg, Germany. She has been a prominent figure for multiculturalism studies in Europe, focusing on law, protection of minorities and fundamental freedoms. Foblets has successfully led several internationally acclaimed research projects, such as the EU-funded Religare programme dealing with how religion is handled by national courts in the European Union. For more than 10 years, Foblets has maintained close relationships with Uppsala University and the Faculty of Law. Andrew P. Simester (born in 1966) is a professor at the National University of Singapore and Edmund-Davies Professor at King’s College London. Simester has extensive scholarly writings in criminal law and legal philosophy. His works include Criminal Law: Theory and Doctrine and Principles of Criminal Law, both of which have been published in several editions. For many years Simester has collaborated with researchers at Uppsala University, and he was a visiting professor at the Faculty of Law from 2010 to 2016.